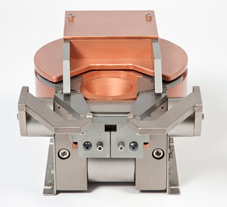 The Multi-Hearth Electron Beam Source is a heavy duty source offering large hearth capacity, high deposition rates, long filament life, and industrial reliability for R&D or production line applications. The source has four (4) crucibles which can be rotated into position either manually or automatically. The source is designed to operate at input power levels up to 12 kW. The 270° bent beam design permits complete shielding of the filament from evaporated material and falling debris and protects “line of sight” to the substrates. The source is also equipped with a water-cooled trap and permanent magnet for greater operating efficiency and safety. The electron beam can be swept in both the X and Y axis for optimum evaporation.